UPDATED: 3:30PM: For grammar and clarity. SPRINGFIELD—On the surface, last week’s Committee of the Whole meeting seemed to be a dispute about casino jobs. However, complaints that the job training program is available only to certain residents of the city belie a broader mistrust, one that has grown up around how the city distributes the grant money it receives from the feds, the state and other sources. At the meeting, councilors, residents and city grant officials crossed swords over the program operated by Springfield Technical Community College. Funded by disaster money, only residents of or those relocated from areas hit by the 2011 tornado could apply. Yet, what instigated the brouhaha here was a flyer, which advertised training for jobs in casinos, among other potential employers. The fracas comes amid larger questions about whether Community Development Block Grants—to name just one pot of city money—is going to same people and whether it is being used effectively. With the city in line for an eight-digit boost to revenue from MGM, questions about how the city spends large amounts of discretionary income have become paramount. A complex history of doubt and accusations surrounds Springfield’s distribution of grants and public money, often following political fault lines. Even complaints about this program have attracted skepticism as to whether objectors were seeking political gain and/or coveted the grant money itself. The funds at issue are part of $21.8 million the city received from the US Department of Housing and Urban Development in disaster recovery CDBG money. 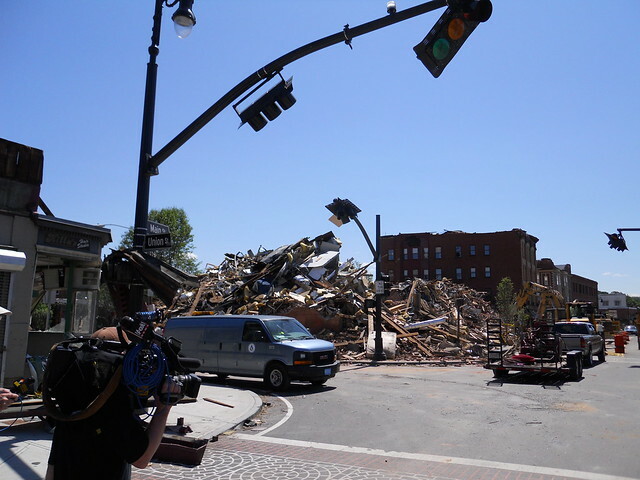 The city became eligible for the funds after it was declared a disaster area, but could only spend the money in the South End, Maple Heights/Six Corners and East Forest Park, all neighborhoods the tornado tore through. This detail, muddied by the mere mention of casinos in the flyer, led several residents, particularly some from the North End, to decry their community’s exclusion. The meeting’s tone became tense, descending into crosstalk at times. Jose Gonzalez, a resident of the North End insisted that CDBG could not be geographically restricted. “I know more about the North End than most of the people here!” he declared. Tina Quagliato, the Director of Disaster Recovery and Compliance, audibly frustrated at times, tried to clarify the difference between CDBG-DR and the city’s regular, annual allotment of CDBG. She said a training program paid by the regular funds, in theory, would have no inherent neighborhood limits. Quagliato and then Samalid Hogan, a project manager in Planning & Economic Development, eventually talked councilors and residents down from their concerns. Hogan explained that the program offers general customer service training for a number positions, including those in casinos. Bob LePage, STCC’s Vice-President of Foundation and Workforce training, was in attendance and took blame for confusion about the flyer’s references to casinos. He affirmed that MGM was not involved and explained the program mirrors those STCC already runs. Quagliato conceded the flyer should be edited to alert those displaced by the tornado that they qualify for the program, too. Ultimately, much of the sound and fury seemed due to a misunderstanding. Councilors peppered Hogan, LePage, Quagliato and Administration and Finance Director of Development Services Cathy Buono with questions and a few admonitions, but little more. Quagliato told WMassP&I that the city set aside $250,000 out of the $21.8 million for job training. In addition to $94,000 for STCC’s program, Training Resources of America, a relative newcomer to city bids, received $85,000 for job training programs. The remainder was set to go to another bidder, but it balked at the paperwork needed for compliance. Even with the geographic question put to rest, some councilors criticized the city’s use of one-time funds like CDBG-DR on job training and not hard assets like infrastructure. According to Quagliato, however, job training was a top suggestion at community meetings the city held on spending recovery funds. A HUD spokesperson confirmed that job training is a permissible use of CDBG-DR money. “Disaster-related activities are those that are able to demonstrate a logical connection between the impacts of the covered disaster and the activity’s contribution to community recovery,” she continued. Quagliato added the city’s recovery from the tornado has been uneven and job training was one way to try to correct that. Both she and Buono, whose office oversees the annual CDBG, confirmed the final decision on how to spend CDBG-DR funds was Mayor Domenic Sarno’s. But if the city was in the clear on using CDBG-DR funds for job training and the geographic restriction was due to federal rules, the episode still reignited suspicions about grants going to the city. Although not in this case, councilors and community activists have complained that money often flows to well-connected people and institutions like the New England Farm Workers and New North. Buono stated she and others try to spread the word about programs beyond the usual suspects. She said her department advertises on Spanish radio stations and holds nighttime meetings in the community with a Spanish translator on hand, but “we hardly get anybody.” Buono added she was open to any ideas that could broaden outreach. Luna, while not alleging city officials disobey the letter of bidding and procurement laws, suggested outreach efforts were insufficient. City officials, she said, “wait until the last minute to inform the community” about the grants and RFP’s. 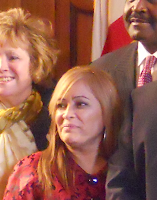 She disputed the city’s use of Spanish-language media. Some councilors and activists wonder if any plan to use grant money generally, particularly large pots like CDBG, exists. Both the spending and awarding of grants may seem ends in themselves and not part of a bigger strategy to improve infrastructure or actually prepare Springfield’s workforce for jobs. Ward 7 councilor Timothy Allen, who attended last week’s meeting, said he would like to see city stakeholders, including the Council, work together to formulate a way to best use these moneys. “Anytime that we have these large amounts of grant money particularly like CDBG, I’d like to see the decision [on their use] be the result of collective thinking,” he explained.